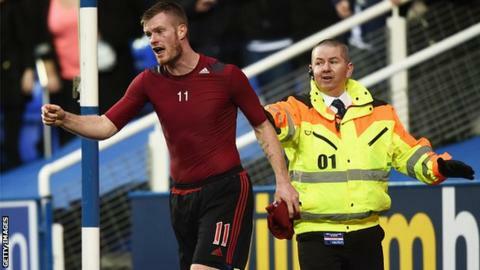 West Bromwich Albion supporters are to hold bucket collections for a charity of Chris Brunt's choice after the defender was struck by a coin. Brunt had gone to give his shirt to a visiting fan after Albion lost 3-1 in the FA Cup fifth round at Championship side Reading on Saturday. A group of fans will hold collections outside The Hawthorns before Saturday's league game against Crystal Palace. "We want to show Albion fans are not all like that," said fan Debbie Green. Brunt, 31, said he was "disgusted" and "ashamed" after being struck on the face by a coin thrown by a West Brom supporter. "I was angry with the result but no way would you throw anything," Green, 54, who was at Reading and is helping to organise the collection, told BBC Sport. "After the game, Chris was the only one who walked up to the fans and clapped them. "I was about 25 feet away from what happened. Most were clapping him back and then you get this one idiot. "Chris had given his shirt to a little girl. He didn't deserve that to happen to him. "I have supported Albion for 50 years but I was ashamed to be an Albion fan on Saturday." Up to 30 Albion fans have come forward so far to hold buckets outside the ground and go into pubs near The Hawthorns. All money raised will go to a charity of the Northern Ireland international's choice, added Green. A West Brom spokesman said: "It's a fan-led initiative and we are trying to co-ordinate it. It's got the club's blessing and it's got Chris's blessing." West Brom will feature an image of long-serving Brunt on the front cover of Saturday's programme above the word 'loyalty'. Brunt, who can also play in midfield, joined West Brom from Sheffield Wednesday in 2007 and has played 313 games for the club.